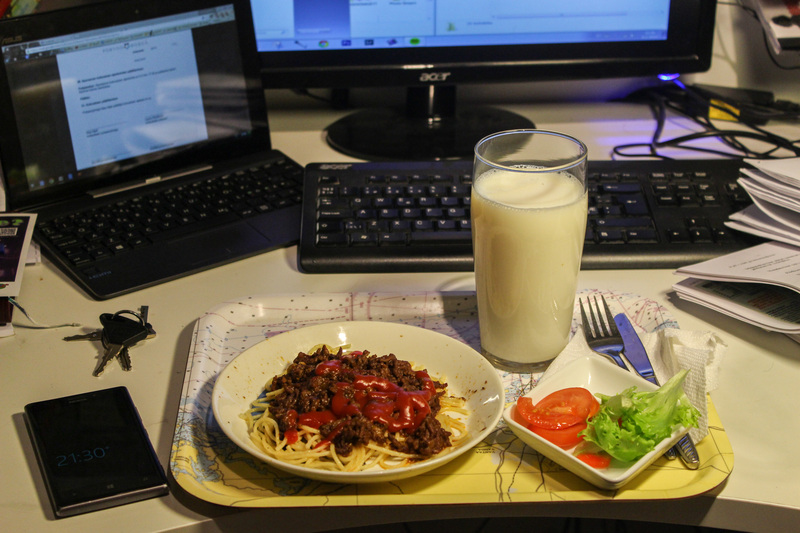 This picture was taken yesterday around 10, when I got home to eat, do some homework and translate the meeting minutes from Finnish to Swedish. At school we worked on our online portfolios, and my made my website into a combined CV and portfolio that’s gonna be up and running in a week or so. Then I went to my friend Juliana’s house (God’ss gift to this world, I don’t know how she stands me 10 hours a day and still manage to be nice to me) for a little snack, before my meeting started. It was the second Youth Council meeting this year, and we had waaaay too much things to go through. We also have a new secretary, and I never thought about how how much work it takes to learn that role when it’s all completely new. She’s a really fast learner though, and is doing good, but it still takes up a lot of time in the meetings. So I was dictating the first half of the meeting and then I fixed and translated the whole thing and finished around 2.00 am. And now I’m back in school for a whole day of Videoproduction 2, a course of which I’m gonna miss 2 full days. So I’m in a bit of trouble haha. And should probably not be blogging.